Splash pages, you gotta' love 'em. A blank canvas where the artist can hit the reader with a large dose of illustrated 'wow'. This time round we end the Thor feature lovefest on IADW, by spotlighting a splashie of the best of Thor-ian legend; Beta Ray Bill, from Secret Invasion: Thor #1. Why anyone would ever let a character as cool as B.R.B pass on, I have no idea. Look at him he's freakin' cool! Having first discovered Beta Ray in this splash from ROM, it's odd he's now at home once again kicking Dire Wraith tail in the pages of Marvel's Annihilators. Drawn by Doug Braithwaite, you can tell who ever has just seen Bill utter these three words will need a new pair of Calvins - at the least. 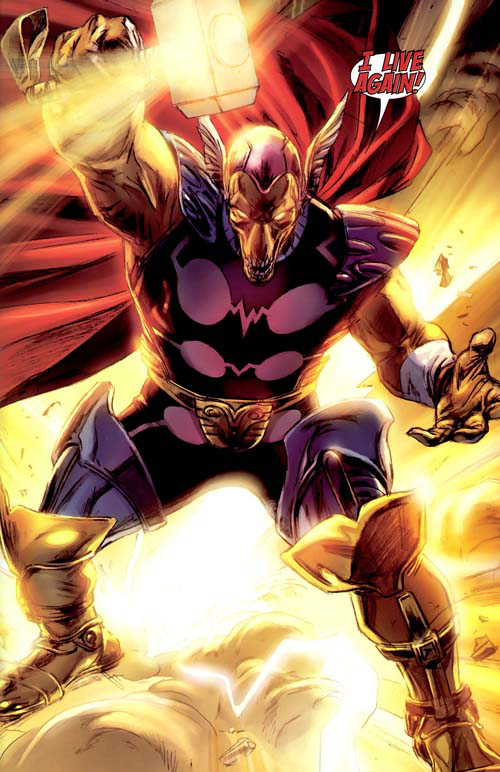 Beta Ray Bill has definitely been one of the highlights of The Annihilators mini-series. prior to The Annihilators i wasn't all that familiar with the character beyond the basics of his background. for anyone out there who wants to get a refresher course on the origins of Beta Ray Bill or any of the rest of The Annihilators team there's this great Youtube video by the Merry Marvelite. this guy's love of all things Marvel is infectious check it out you'll love it! Thanks for the awesome comments Dave, after that page of ROM I hunted down who the 'horse face dude' was, discovered Walt Simonson's Thor and the rest was Asgardian history. I think that run should be essential reading - in fact if I get to be president that and Morrison's JLA will be given away to every baby. your welcome Dan, but when are my comments anything less then awesome?